I remember when I first started playing Scrabble with Phil. The games were always utter disasters and after five or six turns, the score would be so lopsided that he'd basically offer to play my racks for me...even then, he still beat himself pretty handily. However, in early January I started to get up to a respectable 1-6 win record...and now only three or four of his victories would be outright blowouts. So, when we met up today (yes, I know, today is Saturday, but since I'm leaving town tomorrow, I'm calling this Sunday) I wasn't surprised that I won the first game. I had back to back bingoes (the first was entailer, one of my ever growing list of eights!!) and then with violate (which I can only remember by putting the tiles in ovalite order and then saying "Silly, Dawn! Ovalite's not a word don't violate the English language like that!" I kid you not. My head is a strange place to be. Although, Phil taught me four eights today using a similar trick...let's see if I can remember...the angriest rangiest something goes in the ganister...I missed one...but that's still three more eights than I knew this morning!) Anyway, so winning the first game....no biggie. But when I also won the second game...whoa! AND he had both blanks that game...it was crazy. He said that I pretty much played perfectly except missing a easy move where I could have played ing under din for a TWS and playing dey instead of dye with the y on the triple letter square. BUT THEN I WON THE THIRD GAME!!!! I think I got both blanks that game, but still UNPRECEDENTED! I played tasering on the triple line through a T...Phil challenged it off and I was mad. HOW IS TASERING NOT A WORD?? But ganister?? GANISTER IS GOOD!??! But then he tried to play "outloans" and I was pretty sure I learned that it wasn't good...either by having it challenged off when I tried it or looking it up on my own after letting someone else get away with it. So I challenged that off and bingoed through that T with the one of the good words in that rack and went on to post my first ever three game win streak against him...actually...I think it was my first streak of any kind against him! Of course, I was talking so much trash as we played the fourth game "I don't need blanks to bingo!" "I don't need bingoes to win!" "I'll go easy on you this time." So obviously, he crushed me. And proceeded to crush me through the next two games after that. So at our dinner break (is it a break, if we play all through dinner? Hmmm) we played the "championship tiebreaker." This game was RIDICULOUS: We both scored in the mid four hundreds. We both bingoed twice...well, let me backup. 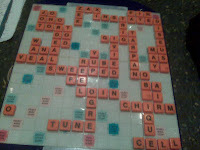 I bingoed with ordeals, hooking onto weeped (I almost challenged weeped...cause dude, that many ees, it just looks wrong! But I didn't. Whew.) He came back with back to back three letter word plays, involving jays and hs (how do you spell H?) that basically equaled my bingo. Then I bingoed on top of rig with instates (I wasn't sure that giga was good...I started laying down satinet next to gig and tried to gauge Phil's reaction, but he gave me nothing! So I chickened out and played instate, even though it opened up THREE triple word score possibilities. Of course, (BECAUSE PHIL ALWAYS HAS IT!! No, really..I play ritz. He has a y and scores more. I play violate right above the triple line, he has an s and a c and zee and all kinds of high point scoring tiles!) He bingoes down the triple line with disuses...THEN I DRAW ZAX and play it on my own triple line for EIGHTY FOUR POINTS!!!!!!!! SOO SICK! But then a few turns later...HE DRAWS THE SECOND BLANK and bingoes with Oblique!!!! ARRGGGHHHH. That was pretty much game...I got some points back with cell...but it wasn't enough I ended up losing by 20. But I couldn't go down like that, so I called for one more game, WHICH I WON! So then we had to play one more championship game....heee heeee. Scrabble = fun! I am so ready to beat Jim Piazza! Just found your blog recently and I'm now a regular reader. Love a good laugh about Scrabble. And "H" is spelled "aitch." OMG! That's awesome!! Aitch!! I can't wait to play that!! Nice! How do you spell the letter e? I'm like a 1100 player now!! !